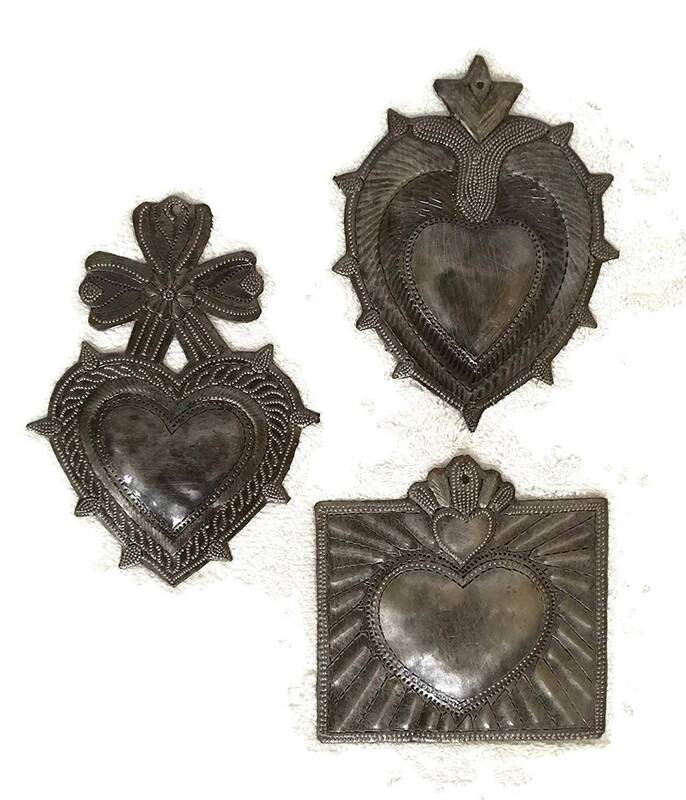 Beautiful Milagro Hearts (set of 3), Handmade in Haiti from Recycled oil drums, 6"
These beautiful, hand crafted wall art pieces are made in Haiti. Perfect for indoor or out!. Made with only his hammer, chisel, and imagination! was denied. All his work, is suffused with his love of life and family. Love the various hearts !!! Gorgeous - very thick, with a lovely finish and a lot of detail. Much love is put into the hand work. Very nice detail in these smaller pieces. I will enjoy putting the in a grouping on an outside wall. Quick shipping....Thanks. We added to our collection with these sets of three hearts. Absolutely love them. They are beautiful. We think they'd make lovely gifts!